Last week’s mid-season premiere of AMC’s The Walking Dead focused on a limited number of zombie apocalypse survivors. We saw what became of Rick (Andrew Lincoln), Carl (Chandler Riggs), and Michonne (Danai Gurira), but the episode left you hanging when it came to everyone else. Personally, I thought this was a good move, as it allowed time to really dig into those three. This week’s offering, “Inmates,” catches us up with the rest of the gang. What have they been up to? Read on to find out, but beware, for there be spoilers. The structure of “Inmates” is simple. Each segment of the show checks in with a different splinter of the leftovers of the group in the wake of the disaster at the prison. When you come back from a commercial break, you get the chance to hang out with someone else. You get why they play it like this, to bring everyone up to speed, but at the same time that you get to see how everyone is doing, you don’t get to spend much time with any of them. 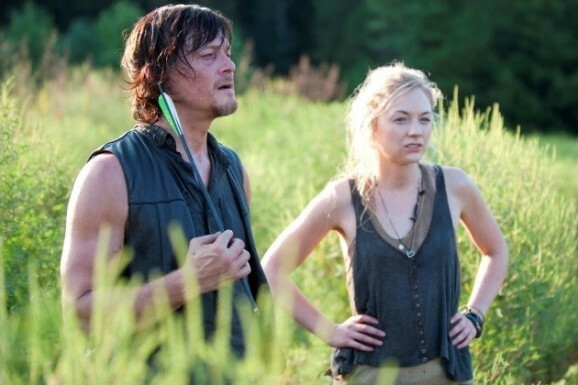 Right out of the gate, you catch up with Beth (Emily Kinney), who has the good fortune, respectively anyway, to be stranded alone in the woods with Daryl (Norman Reedus). Sure, she just saw her father get his head lopped of in front of her, but for survivals sake, you could do worse than being stuck with Daryl Dixon. Her youthful optimism, her faith that everything will work out for the best, has been put to one hell of a test. But as much as she’s been worked over, she still refuses to believe that they’re the only ones alive, and sets out to track their friends. She may, however, be singing a different tune after they stumble on a pack of walkers devouring what could be some of their companions. Tyreese (Chad L. Coleman) made it out alive, but as far as travel companions go, he got the short end of the stick. This segment also features a couple of surprising reveals. He’s stuck with the annoying young blond girls Lizzie (Brighton Sharbino) and Mika (Kyla Kenedy). But he also has a third, unexpected person with him, someone you may not have expected: Judith Grimes. That’s right, Tyreese saved the baby that we all assumed was dead. This move is supposed to tug at everyone’s heartstrings when they imagine the prospect of Rick and Carl being reunited with the infant, but it also feels cheap as hell. For a show that trades in traumatic, through regular, deaths of beloved characters, to bring one back like this is a cop out. They wanted to shock viewers with the reveal of that bloody car seat, to make them gasp, and while they reaped the benefits, shaking up the audience, they didn’t actually want to be the show that killed off a baby. This is also a choice destined to complicate the show moving forward. In Robert Kirkman’s comics, Judith does die in the fracas at the prison. It sends Rick off into full-blown psychosis for a time (in the comics his wife, Lori, dies at the same time, so it’s a double kick in the groin). Now, this is something they’ll have to contend with, again. Granted, The Walking Dead did generally ignore her existence for long stretches of time, and who is to say they won’t do that again, but Judith is a complication. As Tyreese finds out, babies cry, a lot. That’s going to cause problems, too. When Tyreese runs off to save some random strangers surrounded by zombies, he leaves Lizzie and Mika alone. You think for a second that Lizzie, the crueler, more jaded, callous of the two, is going to kill the baby in order to shut her up. She doesn’t, and the next time Tyreese sees his charges, they have someone else with them, shocking reveal number two: Carol (Melissa McBride). We expected her to be back after Rick kicked her to the curb, but the timing is interesting. After sending her away, Rick doesn’t have the opportunity to tell everyone before the Governor arrives and causes a ruckus. He breaks the news to Daryl, but that’s because they’re bros. Therefore, Tyreese doesn’t know Carol was banished, and he also doesn’t notice that she is the one who killed his lady friend earlier in the season. For now they’re cool, but this tandem is going to blow up, in a big, big way eventually. Tyreese’s story has, by far, the most going on, but there’s still more. One of the guys Tyreese tried to help, who has been zombie-bit but is still alive, tells them of a potential sanctuary if they continue to follow the train tracks. And low and behold, they find a sign, enticing them to a place called Terminus. If a hand-written message nailed to a post along some train tracks is to be believed, this is a possible safe haven. Maggie (Lauren Cohan), Bob (Lawrence Gilliard Jr.), and Tyreese’s sister Sasha (Sonequa Martin-Green) are next up. Aside from his drinking, this is the most we get from good old Bob. He’s wounded, but still tries to assure Sasha that her brother is okay. When Maggie storms off to find Glenn (Steven Yeun), armed only with a knife, Bob is the one that convinces Sasha to go along, to keep their little group together. He doesn’t just want to survive, he wants to make surviving mean something, or there’s no point. This is the least interesting part of “Inmates.” They find the bus that escaped the prison, the one that Maggie things Glenn is on, but we know that he isn’t. Because of that, the scene loses a great deal of tension. Sure, one of them could get eaten by the walkers they let off the bus one by one, but we know that her husband isn’t going to be among them. Overall, this is the weakest section of the episode, and the pace and momentum sags. Rounding out the episode, we have Glenn. He’s still back at the prison, unconscious amidst the rubble, and surrounded by hungry, hungry walkers. Basically, he’s alone and screwed. After damn near giving up, stuck in the middle of the ruins of his life, surrounded by death, smoke, and dead folks who want to munch on his brain. You’d think about getting out, too. Glenn’s story doesn’t hold up to the first two segments of “Inmates,” but it does offer the most important surprise of an episode full of pretty shocking reveals. After gearing up in his handy dandy prison-issue body armor, loading up a backpack full of supplies, and hitting the dusty trail, Glenn spies another human survivor, Tara (Alanna Masterson) from those tedious episodes with the Governor. The two form an uneasy alliance and take to the road. It’s outside, after Glenn learns of the death of his father-in-law, that we learn the biggest news of the episode. We’ve known they were coming, but the last thing that happens this week is the introduction of three key new additions to the cast. Yes, it’s true, we finally get to meet, albeit briefly, Abraham Ford (Michael Cudlitz), Rosita Espinosa (Christian Espinosa), and Dr. Eugene Porter (Josh McDermitt). As up and down as “Inmates” is—the first two chapters are both strong, but the latter pieces falter—the impact will be long lasting. Abraham, Rosita, and Eugene play huge roles as the story progresses, and will be incredibly important. The fact that Judith is alive is going to have massive repercussions, especially for the Grimes boys. And then there’s Carol. If and when the group gets back together, Rick is going to have some definite feelings on the matter, as will Daryl. And like I said, when Tyreese finds out the truth, that is not going to end well. While there are some spots that drag, “Inmates” does give you a lot to mull over until next time. I agree. Compared to last week’s episode, this seemed to move too quickly from group to group. It would have been nice to save Glen and Tara for next week, and just finish the episode with him waking up above the walkers – use the extra time to develop the other stories more properly. I didn’t think Judith being alive was a cop out – I didn’t expect her to die, so I wasn’t terribly shocked when she turned up with Tyreese. I thought Tyreese’s behavior in this episode was very odd. He tells the girls to hang out in the forest by themselves so he can go save people…who has a better chance of surviving, two grown men or two little girls? Even when Tyreese hears the gun shot, he STILL doesn’t go back to the girls. Maybe he’s thinking about his own survival now, and he figures he has a better chance with grownups than kids…but I don’t think the show meant to portray him in that light. Why would Tyreese leave a baby with two children and run off after strangers? Heck, even if he knew for a fact that the screams were from Sasha… he should of taken the children with him to scope out the scene of the screaming, at the very least. The younger even begged him. It just didnt sit right with me at all. It’s like the writers couldnt figure out a better way for Carole to show up and rescue the kids. So the made Tyresse do something completely out of character. Agreed. The kids should have been close. And they could have had Carol come up behind them. Heck, do it with that cliche 1st-person view so you’d think it was a walker.